As our small propeller plane flew over the Ngong Hills, Nairobi quickly disappeared behind us. I immediately thought of scenes from Out of Africa, eager and excited to soon experience the Masai Mara in Kenya. "An experience of a lifetime," one is told to expect of the Mara. A safari that many only dream of going on and only the lucky few actually get to do. This was not just any safari though. This was to be a week crossing the Masai Mara on horseback with my daughter by my side. With Gordie Church and a pod of Hippos in the Masai Mara. The adventure began with Gordie Church, owner of Safaris Unlimited, greeting us as we landed on a remote dirt airstrip in Narok County, the northernmost section of the Mara-Serengeti ecosystem. What Gordie and his family gave us though was so much more than what we were expecting. Camp consisted of perfectly appointed tents and vanities, with all of the luxuries of a 5-star hotel. Days started with fresh Kenyan coffee and tea delivered to my tent. In the evenings, lavish dinners and night drives rounded out the day, before I would retire to find a hot water bottle under the duvet and my boots polished awaiting my next morning’s ride. Each night, I fell asleep to the sounds of Africa, which welcomed the most wonderful dreams of the day spent. Despite everything about the trip magically seeming to come together, Gordie gives you the chance to spend time with his crew between rides. We felt a part of the family rather than a guest intentionally separated from the operation. With a staff of 20, including three Masai guides who guarded us with night-long fires to keep watch, we traversed 150 km of the Mara, moving between three different campsites that to my astonishment would be set up and ready for us on arrival like magic. 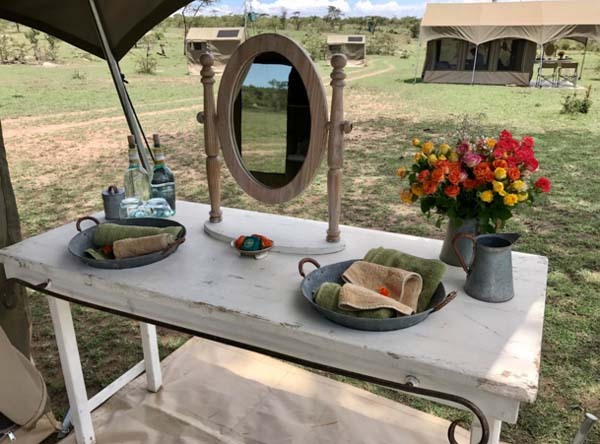 Gordie's team delivered a fantastic dream-like vacation and window to the area, allowing guests to live in the Mara for a week and experience nature as it should be experienced. With a focus on conservation and being eco-friendly, our campsites came and went with us, leaving only the fire pit ashes as evidence we had been there. Camping with some of the most dangerous wildlife in the world suddenly seems normal and acceptable instead of absurd and ridiculous. Rabbits were replaced by springhares, deer and fox seen by many equestrians out on a trail in the northern hemisphere were replaced with hippos and wildebeests as the common sightings. 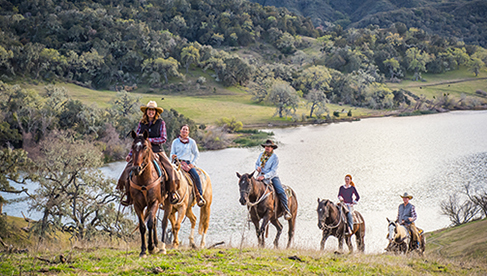 On horseback, the beauty and vast distance of the horizon became our daily views. A respect and appreciation for life was adopted as we were consumed by this exquisite eco-system. 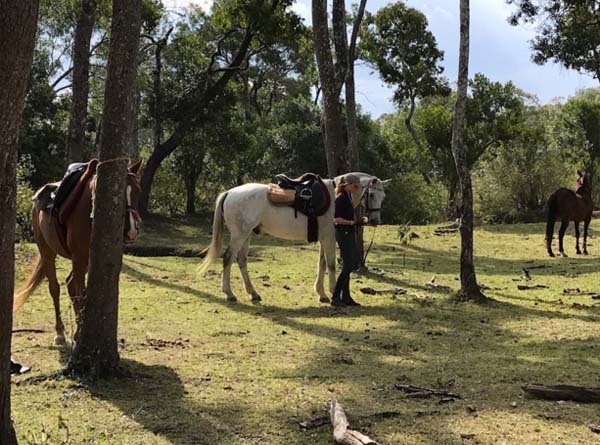 I quickly realized that this experience was one like no other; surrounded by this vast landscape, riding side by the side with Kenya's abundant wildlife. 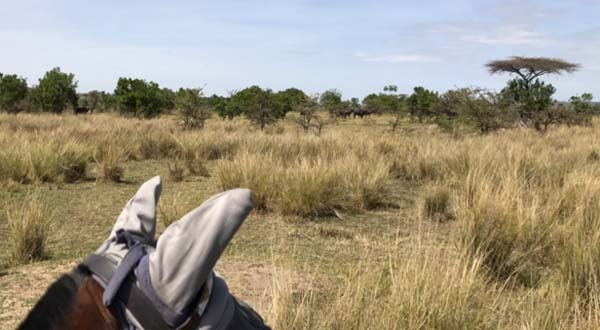 Karen Blixen wrote in Out of Africa, "the animal does everything whole heartedly and for the first time, each time....it is only man who tires of going through it"
Seeing the Mara from the animal's perspective while on horseback was an extra gift most do not experience while on safari. Gordie didn't ride with a rifle. He respected the environment and that we were visitors in a land that belonged to the animals. We were their guests privileged to witness the circle of life. This was more than a safari, this was learning to release day-to-day-learned behaviors and immediately adapt to a different, yet welcomed, way of seeing life. 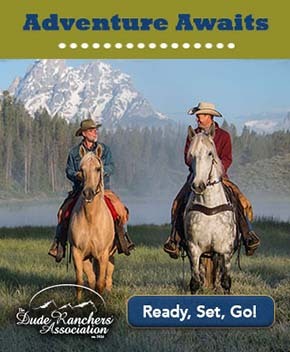 Throughout this unique equestrian safari, Gordie demonstrated that collaboration with your horse, trusting your instincts and that of your mount, was paramount. To be vulnerable and experience the African plains while riding an animal myself connected me to the wildlife surrounding us on a direct level. Seeing animals exist in their most optimal natural environment made me feel a happiness I didn't know I had lost and left me full once again. Picnics and great conversation with fellow riders, fire pits, and dark star-filled nights quickly connected us to a way of living that I had forgotten to appreciate in our technology filled and busy world. It is said that you can see farther in an African night's sky than anywhere else in the world. 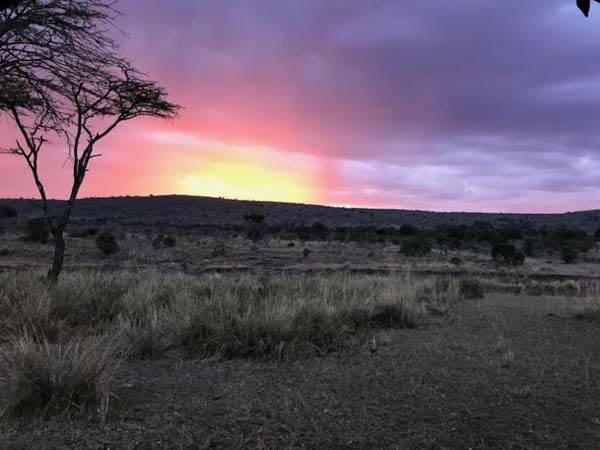 Daisy, one of Gordie's seasonal equestrian crew said, " what I love about the Mara, and what always has me dying to return, is the sense of freedom one feels here in the vast open spaces and the wildness. Feeling free from life's usual occupation, with a freedom to talk to someone properly and to learn who they are and what makes them. Every day is different, as is every animal you encounter. Everything looks at you differently and so you do the same." On our last night, I told Gordie I would miss so many aspects of being on safari that I experienced while being in Kenya. Gordie replied: "What you might miss the most is the quiet and serenity of the Mara". 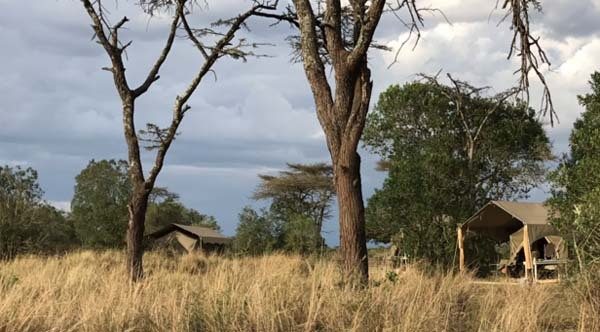 He had knowledge that he knew I would soon discover: I would only be able to fully appreciate the magic of the Mara once I left. 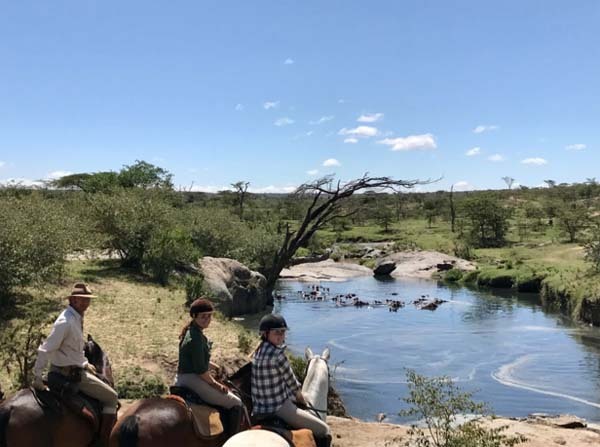 Safaris Unlimited offers set departure dates are for equestrian safaris and custom safaris with requested dates for equestrians and non-equestrian clients. For more information on Safaris Unlimited and how to take your own African dream safari, info@safarisunlimited.com, info@equitrekking.com?subject=Equitrekking%20Travel%20Article%20from%20Caroline">email Goride Church. About the author: Caroline Maffry is an equestrian and member of the Equitrekking team located in Washington, DC. She often takes riding adventrues with her daughter Alexis.